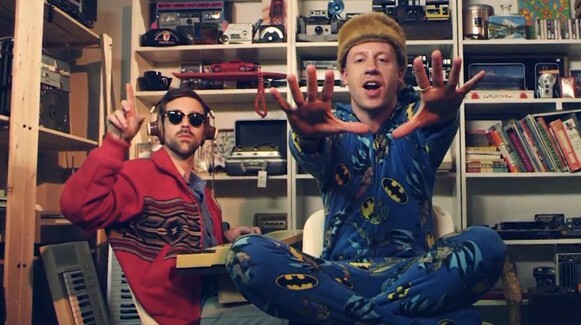 Macklemore and Ryan Lewis just keep dropping new tunes, but are any of them worth your while? Macklemore has come a long way from his days schlepping sandwiches at Subway — and spray painting graffiti all over Seattle on his lunch breaks. Yet, he recalls that time fondly in the new squad anthem "Buckshot," the second single from he and Ryan Lewis this week. While Sunday's "Spoons" (which graphically, and lazily, spells out some under the sheets action) was an eyebrow-raising track, "Buckshot," made in collaboration with KRS-One and DJ Premier, is seemingly a return to form. Here the Seattle hip-hop duo is just having fun being bad: "I'm gonna paint a better world until the cans are empty," Macklemore raps over a moderate tempo. Like other favorite tunes released by the group, the song is largely grounded in a retro sound. The song is yet another single released from the upcoming This Unruly Mess I've Made, the act's first album since their Grammy-winning 2012 disc, The Heist. The new album finally hits next Friday. Who knows how many singles will be sent out into the world before then. Of course, of the singles released thus far, we still like "Downtown" best. Here is an entire track list of the upcoming LP. There's some big name collaborators here, a major change from the duo's first album.